UP to 300 residents of USJ 16 in Subang Jaya turned up at a nearby field, despite the rain, to witness the opening of a residents' centre last Saturday. 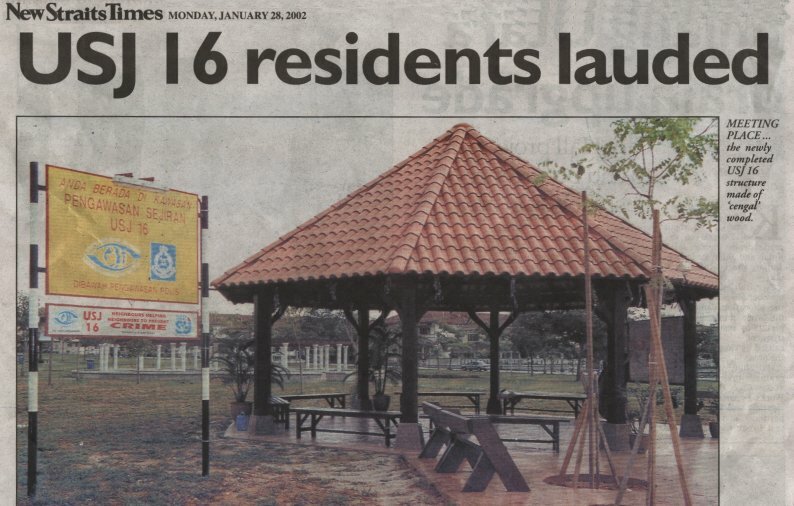 The structure, which looks like a gazebo, is the brainchild of the USJ 16 Neighbourhood Nightwatch committee, established two years ago. The gazebo project took about three months to be completed. It is made out of expensive chengal wood. It stands nine metres high and covers 2,000 sq feet. The wooden structure and carpentry alone cost about RM27,000 while the roof tiles, steel brackets and paint were all donated. A spokesman for the 30-member Nightwatch committee, Jimmy Ooi, said its members had gone from house to house in the neighbourhood to get residents to contribute towards the building of the centre. He said this after the official opening of the building by Subang Jaya State Assemblyman Datuk Lee Hwa Beng last Saturday. Lee told the audience that the mere act of seeing people coming together as an entity, particularly in an urban area, is not as common as it should be. "The residents of USJ 16 have shown that they work as one in whatever project they undertake." He added that the structure has been described as one of the better ones built in the area, and he was "very proud" to have been asked to open it. Lee hoped residents' associations in other areas would follow the example set by the USJ 16 residents. He said people tend to take better care of a project which they had initiated themselves, as there was "a greater sense of pride in such an initiative". "Tonight's event would not have been possible if the residents did not co-operate in order to ensure that the project took off. "It reflects the concept of good neighbourliness. "USJ 16 residents, by and large, have a sense of belonging to this housing estate and have taken the initiative to even help in beautifying the area," said Ooi. The USJ 16 centre will serve as a meeting place for residents, a resting place or shelter for users of the field and the USJ 16 Neighbourhood Nightwatch patrollers, a venue for USJ 16 pot luck parties and other social functions. Ooi said the Nightwatch committee would no longer need to hold its meetings in members' houses. He said the structure stood as a symbol of unity among the residents. "This is the result of sheer hard work and commitment by each resident." Ooi said the committee had submitted an application for approval for the project to the council (MPSJ) last year. Ooi said they had also re-turfed the grass on the field and helped landscape the area around the gazebo.